A stunningly beautiful, hand-crafted copper indoor-outdoor fountain with a decorative look and the relaxing sound of falling waters. This gorgeous and compact, hand-crafted, heavy-gauge copper indoor-outdoor fountain is presented in a classic shrine style motif. Tiered round ledges distract the vigorous water flow as it winds down into the basin, creating a full-bodied stream of melodic sounds as it falls. Made in the USA by David Perlman, world renown sculptor and one of America's finest craftsmen, and his team of trained artisans. Each one-of-a-kind piece is signed and dated by the artist, and includes a lifetime guarantee on materials and craftsmanship. This is not just a fountain, it's a treasured family heirloom. Designed, dated and signed by famous American sculptor David Perlman. Hand-made by artist-led, trained craftsteam. Lifetime guarantee on materials and craftsmanship. Do you have a sound bite we could listen to? BEST ANSWER: I am sorry, a video with sound is not available. 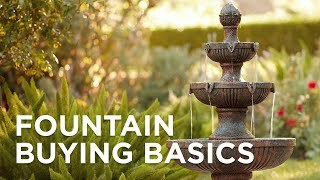 How is the fountain powered? Possible to use solar? BEST ANSWER: Hi - This is a plug-in fountain, not solar. BEST ANSWER: Hi Kathy - this holds approximately 4-5 gallons of water, weighs 17 pounds, and the pump has an adjustable valve. This hand-crafted copper bowl fountain makes a wonderful centerpiece base and can be decorated with river rocks or fresh flower blossoms. Enjoy the look and sound of flowing waters with this hand-crafted copper tabletop fountain that&#39;s a shrine to peace and tranquility.